The Lemann Foundation of Brazil has renewed funding for faculty travel grants to visit top Brazilian universities and research institutions in 2014.
International Institute, Feburary 21, 2014 — The Lemann Foundation of Brazil, which supports the national Scientifc Mobility Program of the Brazilian government, has renewed funding for travel grants for U.S. academics to travel to Brazil as part of that program. Twelve such grants were awarded in 2013. The foundation also funds the Jorge Paulo Lemann Scholarship and Fellowship Program at UCLA, which is administered by UCLA's Center for Brazilian Studies. The new funding will emable a total of 10 professors to make short trips to Brazil in 2014 with the goal of establishing academic connections with Brazilian faculty. Faculty at any of the six partner universities of the foundation in the United States — UCLA, Illinois (Urbana-Champaign), Stanford, Columbia, Harvard, and Yale — may apply. Details about the travel grant program can be found here. The Brazilian Scientific Mobility Program (SMP) funds Brazilian students and post-doctoral researchers to do a year or more of study and research at U.S. universities before returning to Brazil. 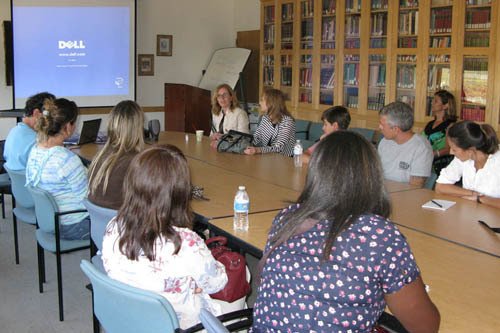 Some 25–30 Brazilian SMP scholarlship recipients are taking courses and conducting mentored research at UCLA during the 2013–14 academic year. Over the course of 2013, SMP awarded a total of 124 scholarships to Brazilian students to attend the partner universities of the Lemann Foundation, an increase of 80 percent over 2012. The foundation awarded supplementary stipends of US$ 300 per month to 91 of these scholarship recipients. For more information about SMP at UCLA, see previous article. For additional information on how the Lemann Foundation supports the goals of SMP at its U.S. partner universities, see this website.